The project to build the new £14.5m Johnstone Town Hall is also helping to build the careers of young people from throughout Renfrewshire and beyond. Work on the new town hall started in October 2013 and will continue until the building opens next summer. The community benefits programme is being delivered by Hub West Scotland, who help manage the contract for the project, which is led by Renfrewshire Council. Once complete, the building will house a range of modern facilities, including a library, 300-seat theatre, marriage suite, conference space, cafe and meeting rooms. It will also be home to offices for the council’s housing and social work departments, Police Scotland and Macmillan Cancer Support. Renfrewshire Council Leader Mark Macmillan visited the site to see progress on construction and met three Renfrewshire residents who have been taken on to work on the programme – Martin Wylie, Dominic Pacitti and Josh Meechan. He said: “Once complete, the new Johnstone Town Hall will be a fantastic hub for the town and surrounding villages. “Since the turn of the year, residents have been watching the building rise from the ground and what they can see now is a very striking-looking structure. “It was great to visit the site and meet the workers as this project takes in two of the biggest priorities of this council – regeneration and jobs. “The council is tackling unemployment by helping organisations create job opportunities for residents, and our Invest in Renfrewshire programme has already produced impressive results on this count. “Plus, the work on the new Johnstone Town Hall is just one of several major town centre regeneration projects happening across Renfrewshire just now. Josh Meechan, 25, from Paisley – who has been hired as an assistant quantity surveyor by BAM – added: “I saw the job advertised through university email and started in January. So far on the project, around 13 per cent of work packages – totaling around £1m – have been awarded to Renfrewshire businesses. The community benefits programme has also seen a series of activity days in local schools, as well as sponsorship of Johnstone Burgh FC. [/vc_column_text][vc_separator icon=”star”][vc_column_text]Courtesy of Renfrewshire Council. 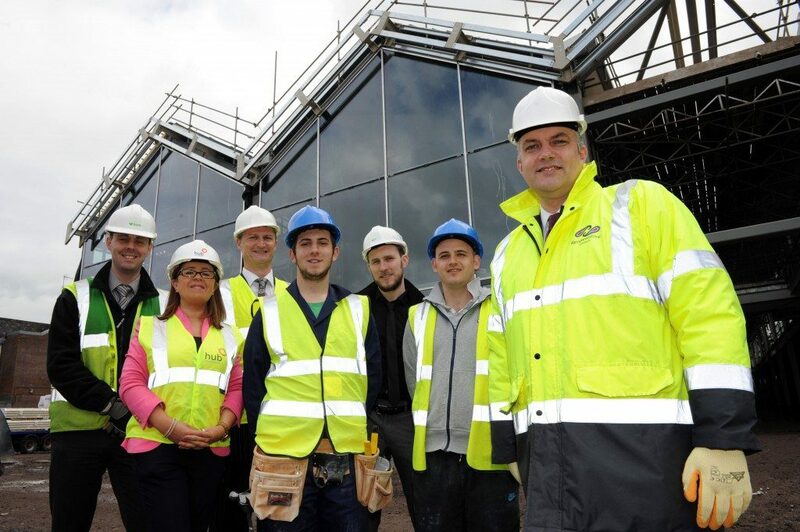 Picture shows Cllr Macmillan (front) with Steven Cheyne (BAM Construction site manager), Lindsey McNaughtan (Hub West Scotland), Neil Watson (Renfrewshire Council), Dominic Pacitti, Josh Meechan and Martin Wylie.